When Kenny Chesney made Songs for the Saints, he was in the midst of evacuating friends from the handful of Caribbean islands, flying in generators, water, medical supplies and tools to the ones starting the clean-up and writing as in-the-moment as he ever has. With his Trip Around The Sun Tour now off to a resounding start – it played to a sold-out 51,312 at Atlanta’s Mercedes-Benz Stadium this weekend – he’s ready to start sharing the music with his fervent No Shoes Nation. In trying to hone in on the song that embodies the deeply personal song cycle to introduce Songs, Chesney settled on the title track. Lean, stretched across a single acoustic guitar figure that’s picked with resolve and a certain strength, “Song for the Saints” will be available everywhere on June 1. Songs for the Saints captures the transformation of vulnerability into unspeakable strength and courage. Tempering the devastation that Hurricanes Irma and Maria left across the bracelet of islands known as the Saints with an unstoppable elation and celebration, the album renders the essence of the freedom the songwriter/superstar found there – and the deep joy and humanity the residents demonstrate on a daily basis. 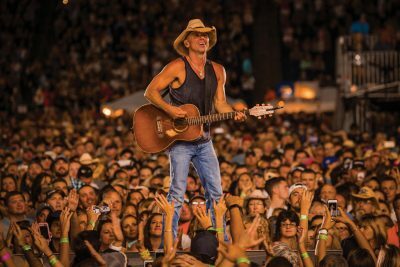 Compare Ticket Prices to See Kenny LIVE! Country Music News Blog participates in advertising programs that help fund the operation of this site. For more information please visit our privacy statement. This entry was posted in Featured, Kenny Chesney, Press Releases by Shauna "WhiskeyChick" Castorena. Bookmark the permalink.